Meet John, Diane and Phil Riehm, the owners and operators of Riehm Produce Farm located at 7244 N. SR 53 outside of Tiffin. John is the fourth generation to run the family-owned farm, started in 1911, and Phil will be the fifth. John is also a unique family farm owner as his father passed away when he was only eight years old. His mother and other family members were able to care for the farm until John was old enough to take over. The Riehms have added many new aspects to their farm over the years. Not only do they grow and sell all types of produce year-round, they also sell eggs, meats and cheeses, run a market, participate in local Farmers Markets and Community Supported Agriculture (CSA), host fun family events and more. The CSA is a great way for consumers to purchase local, seasonal food directly from local farmers. Riehm Farms currently have 300 farm shareholders, but are hoping to reach 400 this year. You can register to be a CSA by May 15th. They also hold seven different yearly events: two Farm-to-Fork Dinners, Barnyard Fun, a 5K Run/Walk (proceeds always benefit a local charity), Trick or Treat Night (featuring a corn maze), Christmas Trees & Family Fun, and the newest event, an Open House. The Seneca County Farmers Market in downtown Tiffin will feature a Flag Day ritual performed by the Tiffin Elks Lodge #94 on Saturday, June 13 on the courthouse lawn beginning at 8:30 a.m. The national observance of Flag Day is June 14. In addition to the Flag Day observance, the Tiffin-Seneca Public Library will be on hand with children’s activities; GEM Yoga will conduct a class at 10 a.m. on the courthouse lawn and Keith Hodkinson of WTSC radio will cover the flag event and provide musical entertainment. 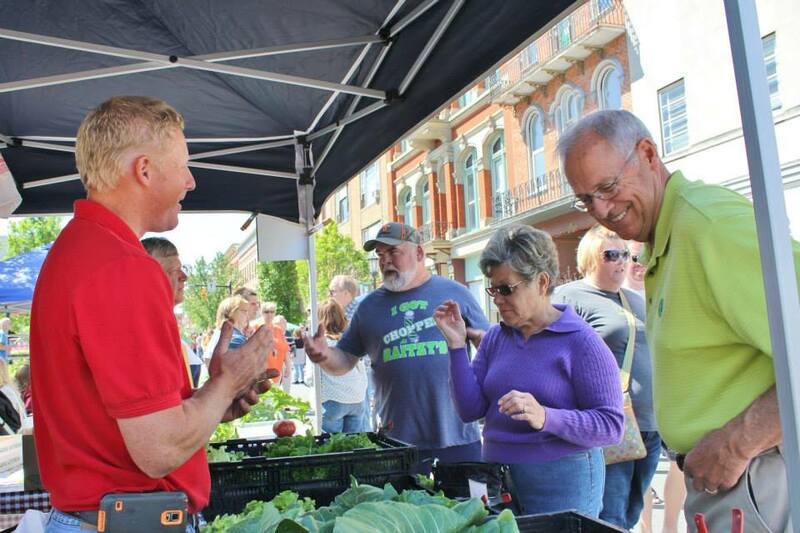 Concurrently, the second of ten Seneca County Farmers Markets will begin at 9 a.m. on South Washington Street between Market and Perry Streets. This month, strawberries will be featured as will a variety of products including baked goods, fresh produce, plants, flowers, and more. Expected Farmers Market vendors include Barb & Dicks, Bella Cuisine, Clay Hill Farms, Drown’s Produce Market, Grannys Cup, J & A Alpine, Joseph’s Greenhouse, JT’s Bagel Bar, Riehm’s Farm Market, Rimelspach Produce Market, Veggies and Such, Sabaidee Coffee House and 7th Heaven Creations. The Seneca County Farmers Market in downtown Tiffin is sponsored by the Seneca Regional Chamber of Commerce and Visitor Services. Vendors interested in participating are encouraged to call 419-447-4141 for more information and registration forms, or visit www.tiffinchamber.com/about/farmers-market/. Markets are held the second and fourth Saturday of each month until Oct. 10.